For as a leading, pharmacy-owned company we prepare our customers for digitalisation. Our customized solutions for outpatient care give you more time to devote to the health of your customers and patients. We offer innovative solutions for tomorrow’s challenges. Get started with us into the future of your pharmacy. Our solutions offer you efficient help. So that you can concentrate on your patients. NOVENTI combines a large number of separate individual companies as a holding company. These companies have an important thing in common: they are all active in the healthcare market. The core target groups are pharmacies, other service providers, care services, and physicians. The NOVENTI brand is a binding element that networks its subsidiaries more closely and creates valuable synergies. This is why we offer our network platform and financing security, which promote important cross-company transfer of expertise. At the same time, the individual companies operate separately. The goal of NOVENTI and all of its individual companies is to continue to expand their market leadership in all segments of the healthcare market. As a trendsetter, we help define the market and advance it by giving it fresh momentum. This gives NOVENTI an innovative momentum for future-oriented processes in the healthcare market. Our balanced corporate strategy allows us constant, healthy growth, and the needs of our customers and the well-being of our employees are the top priority for us. With its 19 billion euros of sales volume, the NOVENTI Group confirmed its role once again as the market leader of electronic prescription billing as it has been for decades. Over 20 independently operating subsidiaries and holdings are combined under the umbrella of the NOVENTI Group. 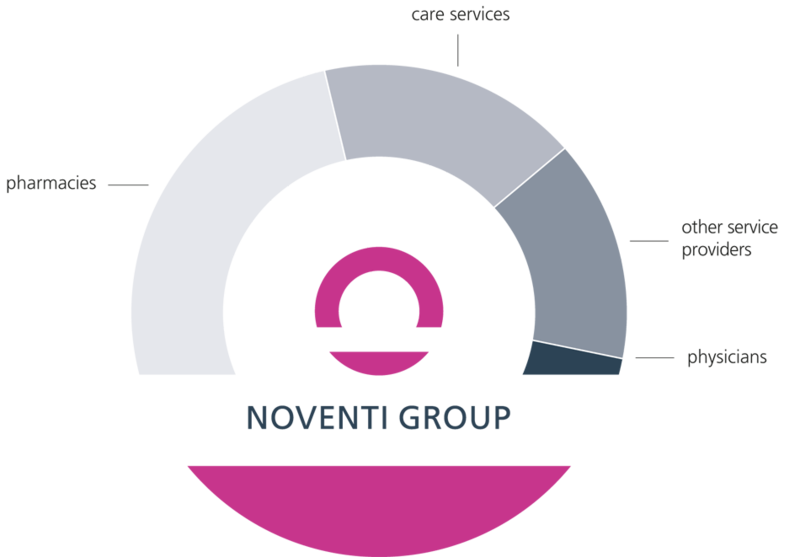 63 million policyholders are professionally managed by customers of the NOVENTI Group – the service providers in the healthcare system. More than 20 locations guarantee excellent on-site customer service and provide us with a future-oriented basis for customer-centered support in an increasingly globalized economy. 50% of all pharmacies in Germany have a customer relationship with NOVENTI Group. Over 50 percent of all pharmacies in Germany have a customer relationship with subsidiaries of the NOVENTI Group. The NOVENTI Group has generated annual sales of 156 million euros with products, services, and system solutions. The individual companies are all market leaders or belong to the top 3 in their market segment. iligen Marktsegment. Over 1,900 employees work with a passionate commitment to the best range of services and products on the market to noticeably lighten our customers’ everyday work load. The NOVENTI Group covers almost the entire health care market with its 360° range of services, innovative products, and services. Today, an important part of the total business activities are divided into the following main business segments: industry software for pharmacies, prescription billing for pharmacies, billing and industry software for other service providers, industry software for care services, as well as private billing for physicians/dentists with a focus on Germany. The NOVENTI Group, its individual companies, and its strong brands offer an extensive network of intelligent solutions to make processes more efficient in the healthcare market. The PRO AvO (PRO on-site pharmacy) Initiative to strengthen owner-operated pharmacies and to harmonize pharmacists’ digital applications is picking up speed.